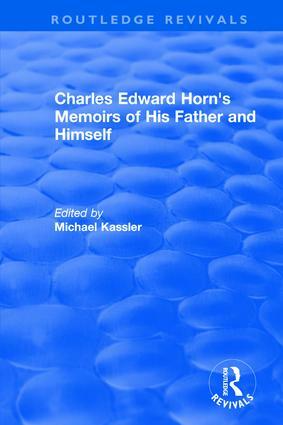 Originally published in 2003, Charles Edward Horn's Memoirs of His Father and Himself is an annotated collection of the memoirs of Charles Edward Horn. They include an account of Horn’s father, Charles Frederick Horn, who arrived penniless in London in 1782 and rose to become music master to Queen Charlotte. Today he is most remembered for his pioneering publications of J.S. Bach’s music in England. Charles Edward Horn’s memoir covers his activities in England and Ireland and provide numerous details of English musical life in the Georgian era not previously known to scholars. They are supplemented in this book by transcripts of four other autobiographical accounts of the Horns, a summary of their extant correspondence and a chronology of their activities.